We’ll be up bright and early (I’m getting up at 6:15am, which for a girl who normally gets up at 8:30… that is EARLY!) because today is the Tacoma Regionals! I’m super excited and can’t wait to see all the awesome ideas and hear some great business and stamping tips from some super talented folks. and then will try to post more info soon here on the blog in the next few days. How do you get FREE ribbon? All you have to do is spend $40 or more on stuff you were going to get anyway! Then, when you place that order before tomorrow night, you get to pick ANY COLOR of Stitched Satin ribbon FREE! Yay! Wanna see some projects using the different ribbons? Check out a few of my posts and projects using the stitched satin ribbon. You can view them all here. I wanted to have a good mix of colors for the cards so they weren’t all red/green combos, so I started thinking blue and that got me thinking sponging for whatever reason. So, this card started coming together. We are going to be punching out an ornament shape from some cardstock (the backing from the designer series paper packs you get) to use as a mask for our Whisper White base. 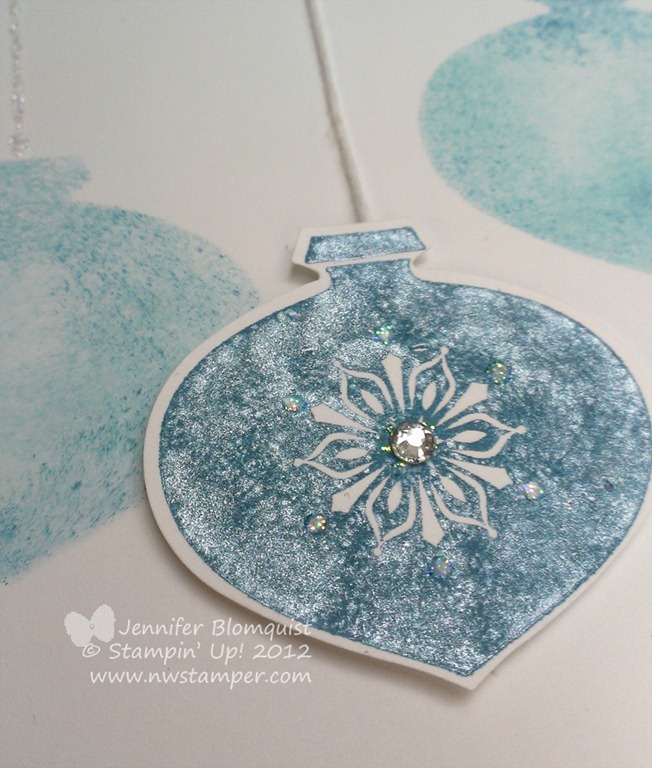 Then we will sponge using Baja Breeze and Island Indigo to make the mottled ornament shapes. Add a bit of Dazzling Details for their “strings” and they make a nice background. To get this look, you ink up your stamp in your color of choice, and then take a sponge dauber and dab it in your Shimmer Paint. Tap the sponge dauber all over the surface of your inked stamp to add the shimmer and then stamp like normal! Very pretty effect! 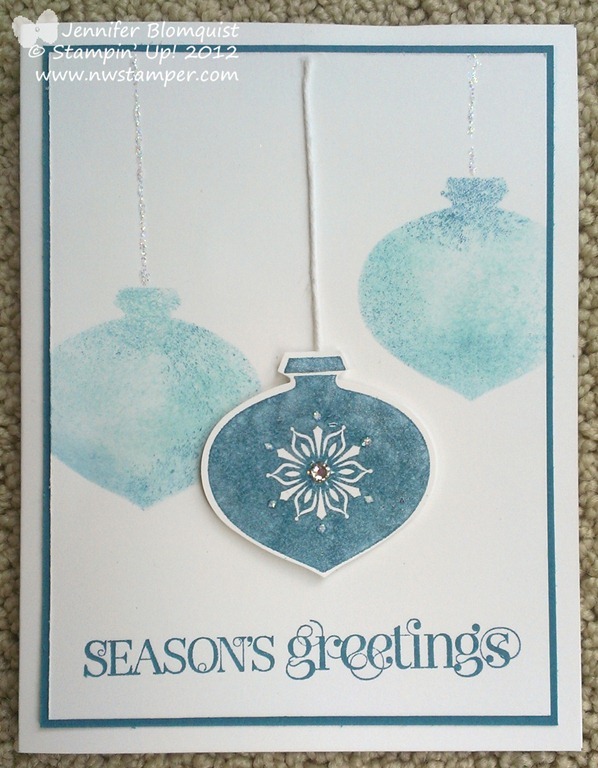 But this is a card that we made in my Build your Stash card class earlier this month and everyone seemed to really enjoy it, plus it is really easy to take this design and switch it up with different stamps and colors you have at home. We used the Just Believe stamp set for everything on this card. The leaves on the right side of the card were stamped with Certainly Celery ink onto the Certainly Celery cardstock. 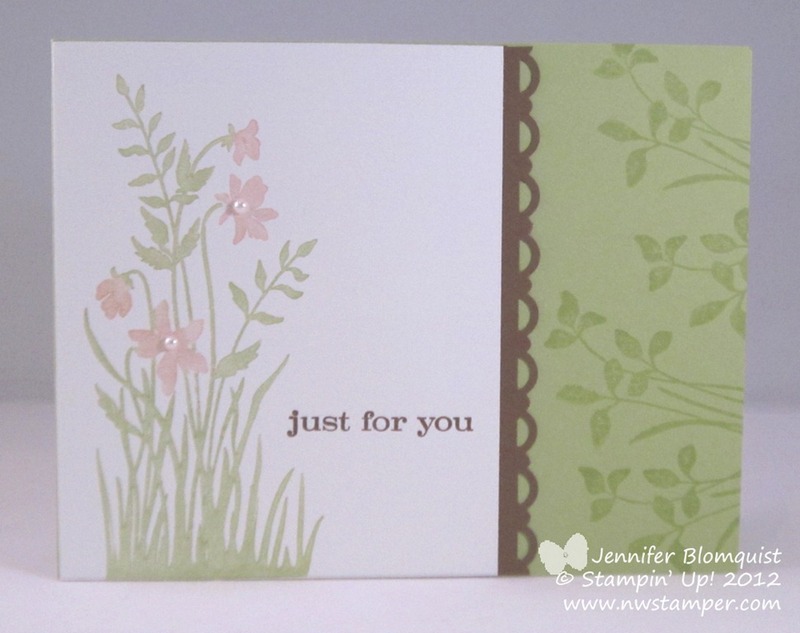 Then for the flower and grass image, we just used Certainly Celery and Pink Pirouette markers to color them in. 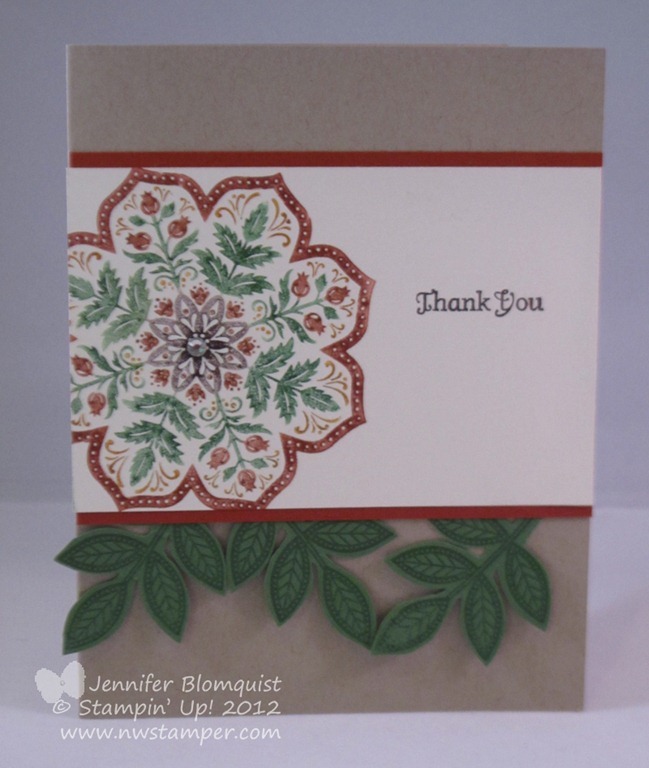 Add some Soft Suede for the trim and the sentiment and it’s a nice subtle card that can be used whenever you need it! Leave me a link in a comment here to where you’ve posted your card or post it up on my Facebook page for everyone to see! Are You Ready for 12 Weeks of Christmas Inspiration? That’s right! This year I’m putting together a special treat for my newsletter subscribers and will be sending out a weekly project idea to help you get ready for the Christmas season! Yup! 12 weeks of new Christmas ideas that won’t be posted on my blog, but are sent straight to your inbox every Wednesday. I can’t wait to share with you these fun ideas but you need to be on my mailing list by October 3rd to get the full set of all 12 projects! It will be a blast and I hope you enjoy this gift from me to you! Be sure to receive the Week 1 project starting next week! 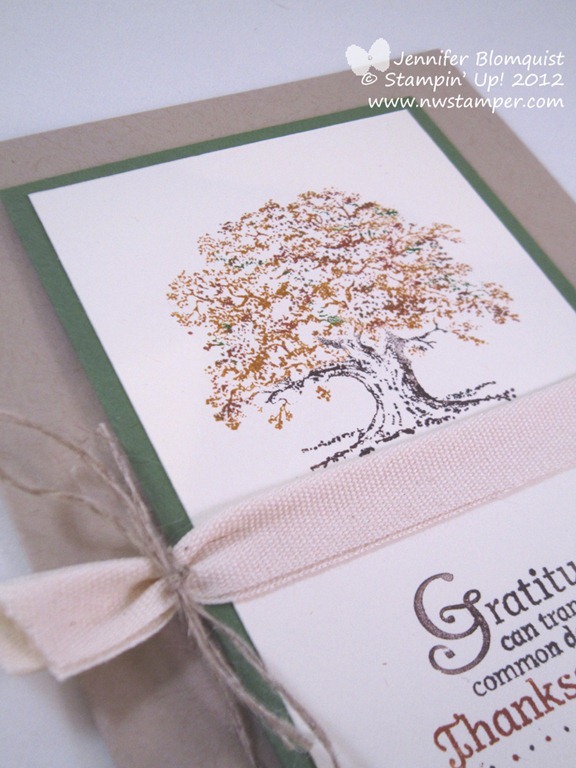 See, sometimes I like to challenge myself to create a card or project using just my scraps on hand and so the Crumb Cake card base, Garden Green cardstock, Lovely as a Tree stamp set, and Day of Gratitude stamp set were all staring at me – begging to be used! The ribbon is the new 7/8” Cotton Ribbon from the Holiday Mini. I just folded it in half (I actually ran my snail along one edge to help stick it together when I folded it) and wrapped it around my stamped layer. Then I used some Linen Thread to tie it together on one side. Simple, but oh so Autumn! And if you are already thinking past Fall, I invite you to join me for my Christmas Card stamp-a-stacks starting up this weekend and running each month for the next 3 months! I’ll have everything precut and ready for you to get creating right away! Everything you need for 12 cards plus envelopes is only $25. Visit my events calendar to RSVP if you can join us! 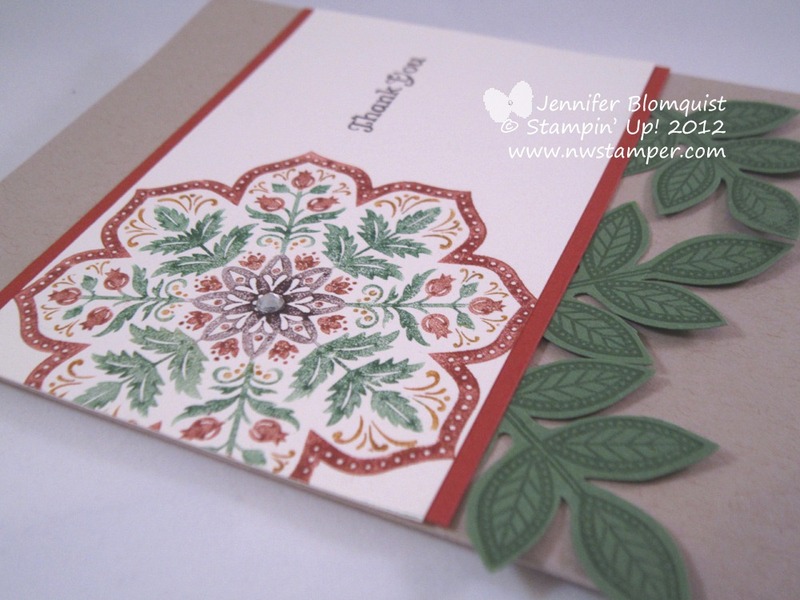 I’m sharing a card today that I made for a monthly swap with my team (Jennie, hope you liked your card!) The theme was Thank You cards and so I started digging around in my stamp sets for inspiration and came up with the Day of Gratitude stamp set. This stamp set often gets buried for a while and usually in the fall I rediscover how pretty it can be and it starts getting more and more use. Well, I decide to take full advantage this time of the intricate design for the big flower/doily/stamp-thingy 😉 So, I grabbed my markers and got to work. Sure it took a while to color in all of the parts, but thankfully “huffing” on the stamp (ie – breathing on it like you are trying to fog up a mirror) at the end kept it all moist. And besides, it felt good to put some extra time into a card for my downline, Jennie. I am so glad to have her in my group that I was happy to make a card that took a little more effort. Anyway, I thought it was a little different of a look on a card and had fun making it. I hope she enjoyed receiving it! What do you all think of the hanging leaves under the stamped mat? 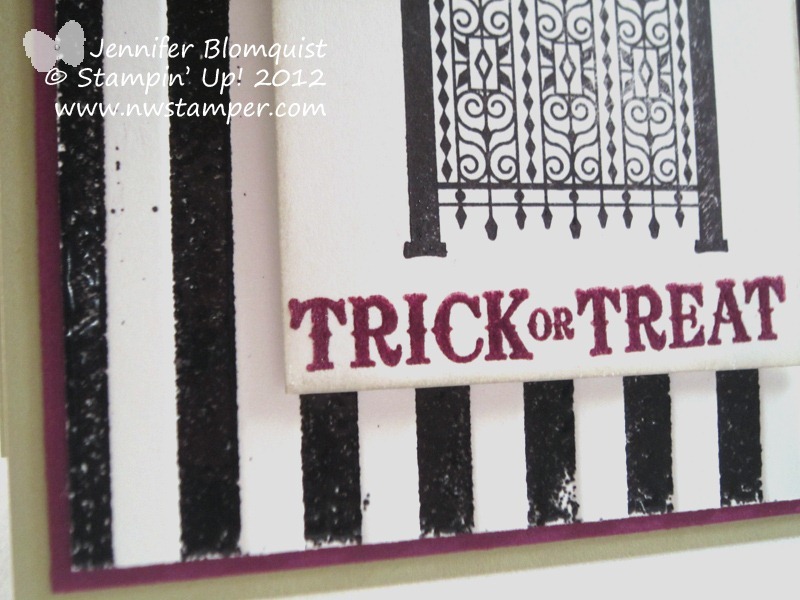 Yesterday I highlighted the Emboss Resist card from my Awesome Embossing class that I’m holding today. And as promised, here is my first Halloween card of the season and the card we will be making to try out Double Embossing! If you can’t tell, this isn’t striped printed paper – it is heat embossed with Black Embossing powder! 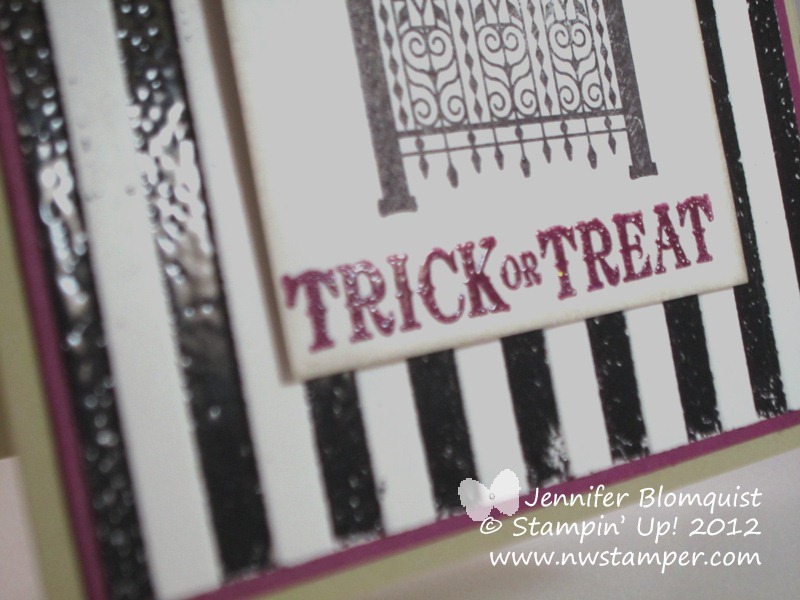 Now the best part is it is really easy to do thanks to the Stripes Embossing Folder. The basic idea is that you ink up your embossing folder with Versamark ink before you run it through the Big Shot. The big question is the best way to ink up your folder. Now I experimented with a few different methods for doing this and started with a brayer and my Versamark pad, and tried inking up the side of the embossing folder with the raised plastic (so the part that would press into the paper and become the “insides” of the stripes). And every time I would run the folder through the Big Shot, I would only get part of ink to stick to the paper. 😦 So, I started pressing my ink pad directly to the raised part of the embossing folder and didn’t get much better luck. Finally, I tried taking my Versamark ink pad directly to the “flat” side of the embossing folder (the side that is mostly flat with some striped “holes” in it). And that worked great! So, if you are just trying this technique out, I would recommend taking your Versamark Ink pad directly to the flat side of your embossing folder! The rest of the card used the Toxic Treats stamp set and the trick I shared the other day for using Versamark and Classic ink at the same time to heat emboss any color of ink. 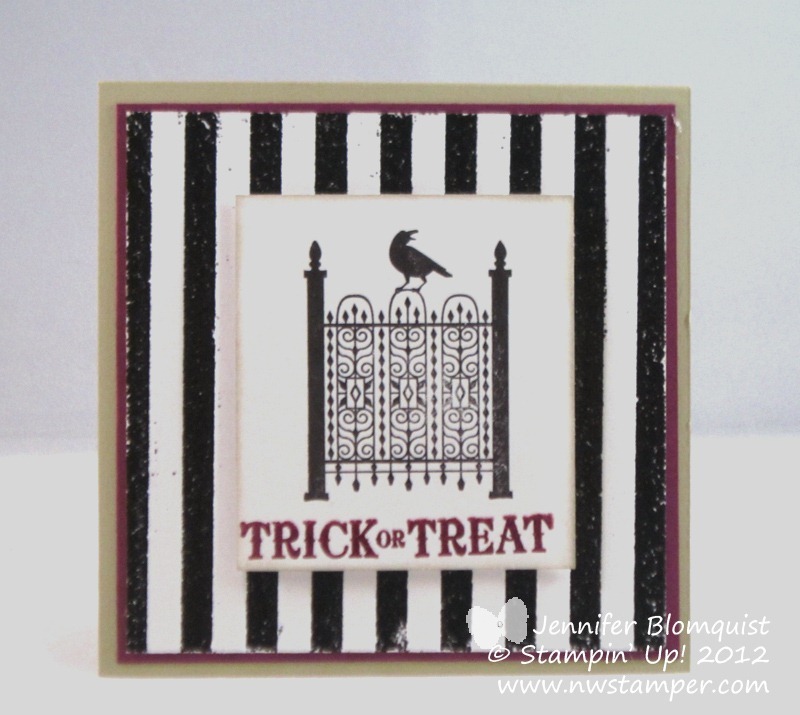 So, I hope you enjoyed these ideas and give Double Embossing a try!